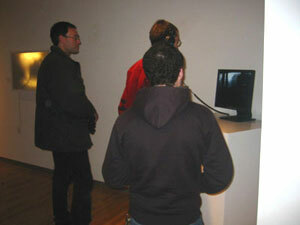 This gallery installation was shown in Providence, RI during the last week of Jan 2004. The piece was an experiment in building a physical interface for interaction, playing recorded video footage on real-time 3D graphics. Left on its own, the monitor displayed a city comprised of 3D shapes with odd shifting colors. When activated by a viewer standing on the pressure plate, the city morphed into a flat screen, and the shifting colors turned out to be a a movie shot in the NYC subway. The video footage used in the piece was recorded by Augusto Landauro. 3D graphics were created in Maya and the interactive software was written using Blitz3D. In this piece we lured participants (ie. 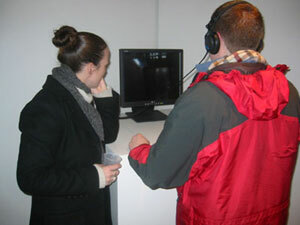 people interacting with the piece) into perceiving a city on at least two levels: that of the abstracted 3D graphics and that of the video footage displayed on the 3D surfaces. The dual city representations roughly mimic the central duality in epistemological understandings of spatial memory. On the one hand, the polygonal 3D graphics contributed a rational and objective sense of the city, not unlike a map or aerial photograph. The movie however invoked a more personal experience of the city, recording in first-person a specific individual's subway ride. These representations correspond to navigating via a holistic map seen with the mind's eye, versus remembered impressions and landmarks along a known path. The fact that the polygonal city was the screen for the movie city pointed toward the idea that a full understanding of the city could only come from overlaying the disparate mental models. As alluded to above, the gallery installation developed from a process of experimentation. 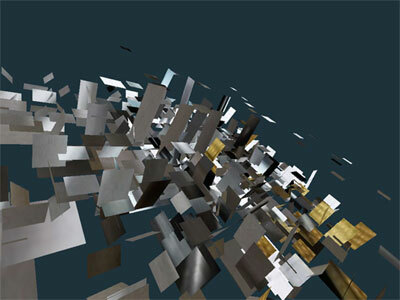 Technical experimentation revolved around writing software to morph polygonal geometry from one 3D form to another, and playback of video footage on a 3D surface. Conceptual experimentation revolved around questions of what forms to morph between, what footage to display, and in both cases, "Why?" Additionally, after the ideas regarding the city were solidified, we addressed the physical interface, deciding to implement something more interesting and relevant to the piece than simply using a mouse or keyboard. Ideas such as a treadmill or an overhead subway bar were considered. Ultimately however a floor-mounted pressure plate was used in the gallery. 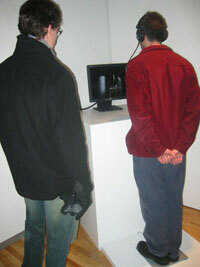 This solution recommended itself due to its enhancement of the concept of the piece, resulting in imagery which shifted based on the near/far viewing perspective of the participant. The hardware was fairly simply to install, with an off-the-shelf floor sensor connected to a hacked keyboard (thanks to Gideon Webster for help soldering,) which was in turn connected to the computer.